November 19, 2009 marked the date the US Mint released the Zachary Taylor Presidential $1 Coin to honor the 12th president of the United States. Known more for his accomplishments as a soldier than as a president, owing partly to his death during his first term. Born in Virginia but raised mostly in Kentucky, Zachary Taylor received little education as a child. He reportedly suffered from poor handwriting, grammar and spelling his entire life. This lack of education did not stop his desire to join the US Army. In fact, he received a commission upon joining to become a first lieutenant, owing to his cousin James Madison. This special treatment proved to be well placed, as Taylor quickly proved he was a brave and capable officer. Taylor masterminded many successful campaigns, including leading the 1st Infantry Regiment in the Black Hawk War of 1832, resulting in the surrender of Chief Black Hawk. He also was instrumental in the war with Mexico, the victory of which led to millions of acres being ceded to the United States. "The idea that I should become President seems to me too visionary to require a serious answer. It has never entered my head, nor is it likely to enter the head of any other person." It did, however, enter the heads of many and he was elected president in 1848. To his detriment, Taylor proved to be too non-political and appeared to have difficulties securing allies in Congress to support his positions. Taylor's administration would prove to be a short one. On July 4, 1850, during a hot Independence Day celebration, Taylor consumed a lot of milk and cherries, as well as ate several dishes provided by citizens. A few hours later he took ill, and died 5 days later. Officially, he died from gastroenteritis, but several believe he may have been poisoned by one of the dishes. This theory has never been proven. 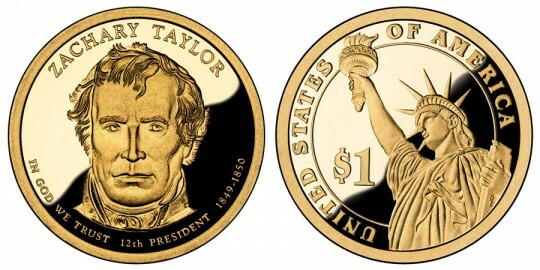 Designed by Don Everhart, the obverse features an image of Taylor with the inscriptions "Zachary Taylor", "12th President", "In God We Trust" and "1849 -1850."